A week ago we looked at three PPR tight end sleepers for 2018. Now we are going to switch directions and take a look at some tight ends that have serious bust potential. In order to do that, we have to take a look at the tight ends that are actually being drafted, and may not finish the year at their ADP. The tight end position has always been tough to draft, with only Travis Kelce and Rob Gronkowski consistently putting up huge numbers. But even now these two TEs have gotten older, missing more and more time due to injuries. Let's take a look at five tight ends that may have bust seasons, and why their potential is a bit higher than others in 2018. The Philadelphia Eagles had an amazing 2017 season. QB Carson Wentz had a huge year, throwing 33 touchdowns in just 13 games. The year before he only threw 16 touchdowns in 16 games. Now Wentz has a small sample size, so it's hard to tell what his true average is, but we can safely assume Wentz is not going to repeat what he did last year. He also may not even be ready to start the season thanks to the ACL tear. So that brings us to TE Zach Ertz. He is being drafted in the fourth round as the third TE off the board. 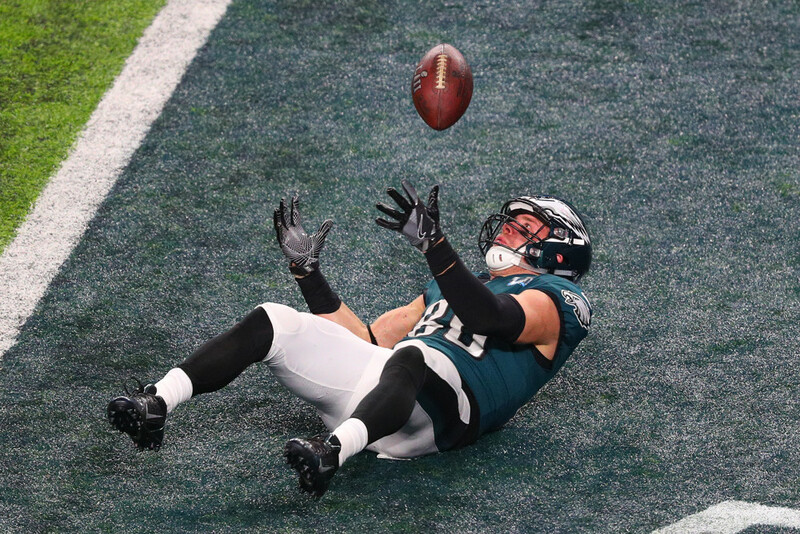 Ertz missed two games due to injury, but still caught 74 passes for 824 yards and 8 touchdowns. His previous career high in touchdowns : four. And that is over his five year career where he started at least 14 games each season. Now Ertz is a great athlete, but the touchdown regression is what makes Ertz a bust candidate in 2018. Not only does Wentz look hesitant so far this preseason, but add to that the fact that both Wentz and Ertz could easily see a touchdown regression. With those points, you may get a tight end that won't perform to owner's standards. Remember Martellus Bennett? Packer fans and fantasy football players alike thought he would be the best TE in years for both the Packers and for fantasy. But as we all know, Bennett was a huge bust in 2017. In 2018, a similar story is being written about Jimmy Graham. Bennett was hyped up, only to disappoint. Part of that was due to an undisclosed injury, but the rest was due to QB Aaron Rodgers (Rodgers did play 6 games with Bennett before injury). Aaron Rodgers simply just doesn't throw to his tight ends. Now we have Graham, who is being hyped up just as much as Bennett was a year ago. Sure Graham has always been a massive threat in the redzone, which is probably why he is being hyped so much. But Graham has a pretty high draft capital, going in the fifth round (5.06) as the fourth TE off the board. That's pretty high for a player switching teams, especially when that team rarely throws to the tight end. Graham may be solid for the Packers, but if he doesn't get the touchdowns everyone thinks he will get, look for him to be a bust in 2018. Evan Engram had one of the best seasons for a rookie tight end in recent history in the 2017 season. He caught 64 passes for 722 yards and six touchdowns. That was good enough to generate some hype in the 2018 season. Engram is going as the sixth overall tight end and is being drafted in the middle of the sixth round (6.06). Engram has bust potential this year mostly because the Giants will hopefully be much healthier this season. Engram had times where he was literally the only target for QB Eli Manning. Now Manning has healthy WRs in OBJ and Sterling Shepard. He also has rookie RB Saquon Barkley, who should catch plenty of catches in the backfield. I don't think Engram will be useless, but his sixth overall TE draft spot may be a bit too high with all the receiving power vying for targets in the 2018 Giants' offense. Jordan Reed was once so good that (shout-out incoming) the Fantasy Footballers coined the nickname Rule 86. Rule 86 stated that if Jordan Reed was playing, you automatically had to put him in your fantasy lineup. Unfortunately for Reed, that may no longer be the case. Injury has plagued the veteran tight end. He has never played a full season. In 2017, he only played in six games, catching 27 passes for 211 yards and two touchdowns. And yet he is still being drafted in the eighth round (8.04) as the ninth TE off the board. It seems as though people still have hope that he will be the dominant TE of a few years ago, but that just might never happen, especially this year. Not only does he have a major injury risk, but he has a new QB in Alex Smith. Smith is not a stranger to throwing to a TE, but he also is no Kirk Cousins. Jack Doyle was one of the TEs we said was undervalued, but he also has a serious bust risk in 2018. He is currently being drafted late in the 10th round (10.10) as the 11th TE off the board. Doyle had a decent season last year, catching 80 passes for 690 yards and four touchdowns. This year Doyle gets QB Andrew Luck back, which could be a blessing and a curse. In previous years with Luck under center, Doyle never really seemed to breakout. On top of that, we have no real clue how Luck will perform coming off a shoulder injury that sidelined him the entire 2017 season. For all we know, Doyle will be held in to block a little more often. The Colts also brought in TE Eric Ebron, who was supposed to be a great tight end prospect for the Lions but simply never panned out. Ebron has talent, and he could take away significant targets from Doyle. Being drafted as a TE-1 may be a little too much to ask from Doyle this year, so weigh the risk:reward carefully.